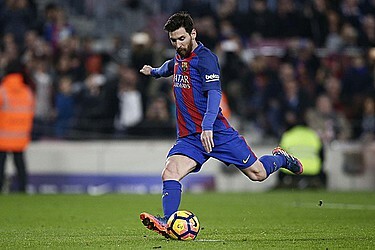 BARCELONA, Spain (AP) — Lionel Messi scored a 90th-minute penalty for his second goal of the night to give Barcelona a 2-1 win over lowly Leganes in the Spanish league on Sunday. Messi's spot-kick, following a questionable penalty after Neymar tumbled in the area, saved Barcelona from a second demoralizing result this week after a 4-0 loss at Paris Saint-Germain in the Champions League on Tuesday. Leganes was clinging to a well-deserved point when Neymar stumbled over Martin Mantovani in the area. The contact was enough to secure a penalty spot and Messi's league-leading 19th goal of the season. The match at Camp Nou started well for the hosts, when Messi tapped in Luis Suarez's cross after just four minutes. But Leganes, a modest club from Madrid that was promoted last season, never lost its poise and threatened whenever it emerged from defending its area. Barcelona goalkeeper Marc-Andre ter Stegen had to make four saves of goal-bound strikes before Leganes's Unai Lopez got the equalizer in the 71st.